a box with letters on it. By varying the aperture, you can show students how the aperture changes the focus of the letters. A discussion of how this ties in with the aperture of a camera lense can accompany this demonstration. Start with a wide aperture. Attach it to the outside of the pinhole camera. Note that you can't make out the letters on the light bulb. Replace the wide apperature with a smaller one. Repeate this until you get to the smallest aperture. 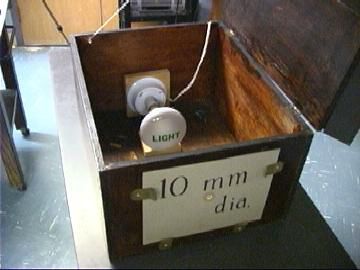 Note that with the smallest aperture, the letters on the light are most in focus. This may be counter intuitive for most students, since they think the wider the oppening the more "information" about the light should get though. Explain that this is one of the critical processes in a camera, and by altering the aperture different photographic effects can be achieved.